The Forge is situated in Whitby and features a bar. 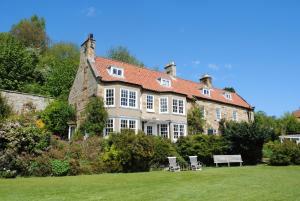 The property is located 5 km from Whitby Abbey, 3.9 km from Whitby Museum and 4.4 km from Whitby Pavillion. Both free WiFi and private parking are accessible at the hotel. At The Forge, the rooms include a wardrobe, a TV and a private bathroom. A Full English/Irish breakfast is available every morning at the property. Whitby Lighthouse is 5 km from the accommodation, while Captain Cook Memorial Museum is 5 km away. When would you like to stay at The Forge ? This family room features a tea/coffee maker. Please note that the bar is closed between 15:00 and 18:00 midweek. Check-in times are from 12:30 to 15:00 or any time after 17:30 from Monday-Friday. Each day we'll check prices and send you an email for your selected dates at The Forge. If you don't have specific dates but would like to check prices for say next weekend or say next month we can check the price too. Click to write a review and share your experience of The Forge with other travellers.